Noted wide runner Sizzling Shane appreciated the pink box this afternoon when he surged around his rivals to win over 405m in 23.00. The son of Banjo Boy began fairly from the wide alley and received a strong shepherd at the first turn from Fab Philippe (box seven) who crossed to the front. Whilst prepared by different trainers the pair are litter brothers. Fab Philippe straightened with a one length advantage but was overhauled close to home by Sizzling Shane who officially prevailed by a head. His time of 23.00 was a sharp improvement on the 23.31 recorded two weeks ago when victorious after settling sixth at the first turn. Sizzling Shane has now started 12 times for Banjup trainer Graeme Hall for 3 wins, 3 minor placings and $7,395 in earnings. 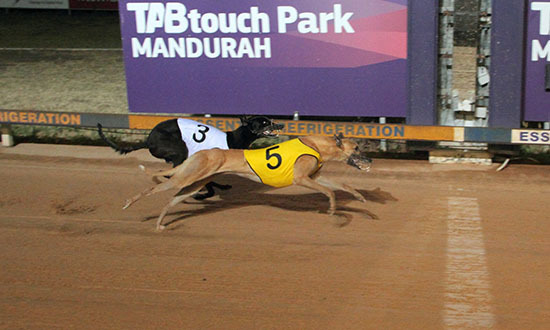 There have been exceptional 490m Mandurah performances this week with youngsters Pinkie Pie winning on Tuesday in 27.58 and Westdale Anne on Thursday in 27.40. 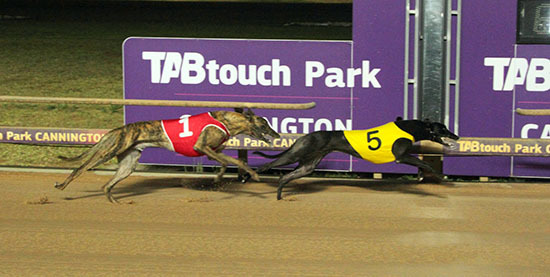 Race 2 Number 2 LAWLESS LOU : Caught the eye with a fast finishing third over 490m. Race 5 Number 6 NAIQAMA : Put in another eye-catching run after a slow getaway. Fleet-footed youngster Helen’s Calling made every post a winner to take out tonight’s Track Fashion Grade 5 over 302m. The daughter of Magic Sprite took seven starts to win a Maiden and that break through was back on March 14 when she clocked 17.44. 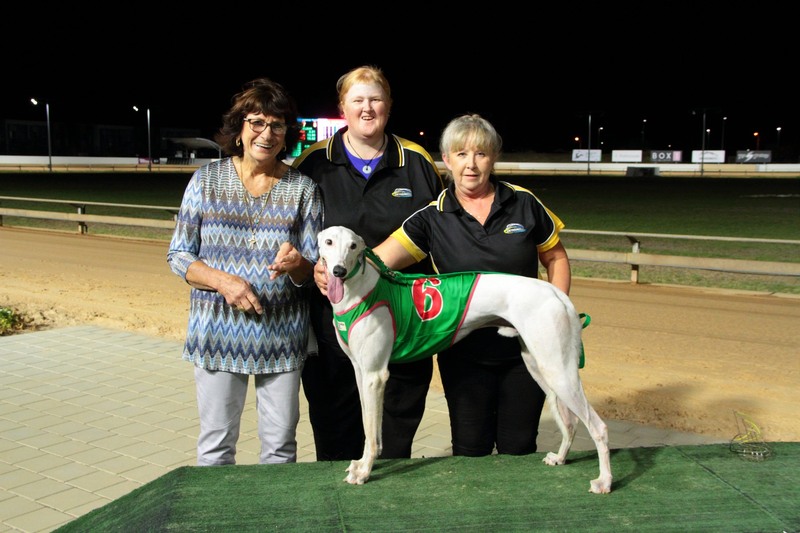 Her four subsequent efforts yielded two wins and two minor placings before tonight’s impressive performance. After being heavily backed into $1.80 she led throughout from box one and posted a new PB of 17.26. The Pete Brown trained Nacho Libre ran on strongly for second ahead of the Shane Beard prepared veteran Hey Bail. 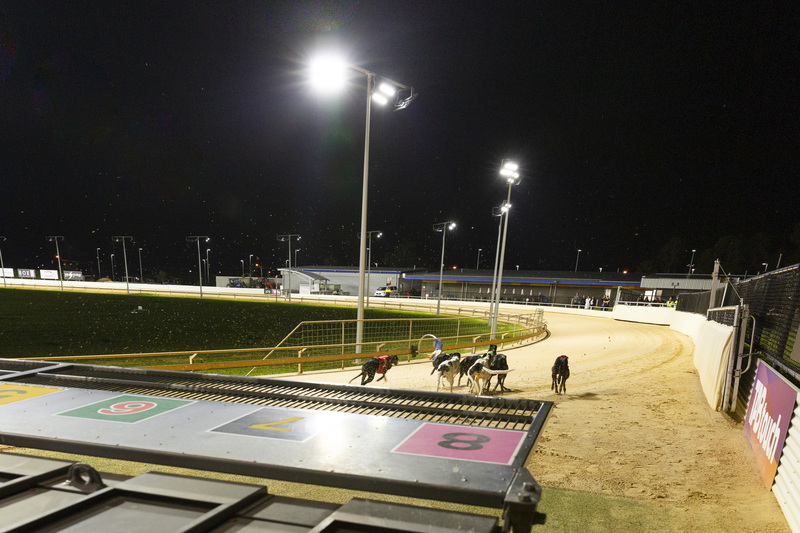 On Saturday night at Cannington Thomas will be hoping kennel star Dandalup Casper can take out the $30,000 Keith Harding Trophy from box five. Race 4 Number 4 WESTDALE ANNE : Whizzed around in a flying 27.40 and hugged the rail throughout. Race 5 Number 6 NAPOLEON BOY : This was a terrific effort after blowing the start, he came from last to almost grab fourth. MAGIC MAMBA (Magic Sprite- Dove Bale) scored an all the way Maiden win on debut scoring by 2 lengths over Who’s Got Subi in 30.15. The Cosi Dagostino trained dog had finished third in a recent trial, however once jumping to the front was to good for his rivals. SPRITE MONELLI (Magic Sprite- Jackie Bale) jumped well and landed in front going past the judge the first time round before racing away for a 7 3/4 length win over Aussie Salute in 29.87. 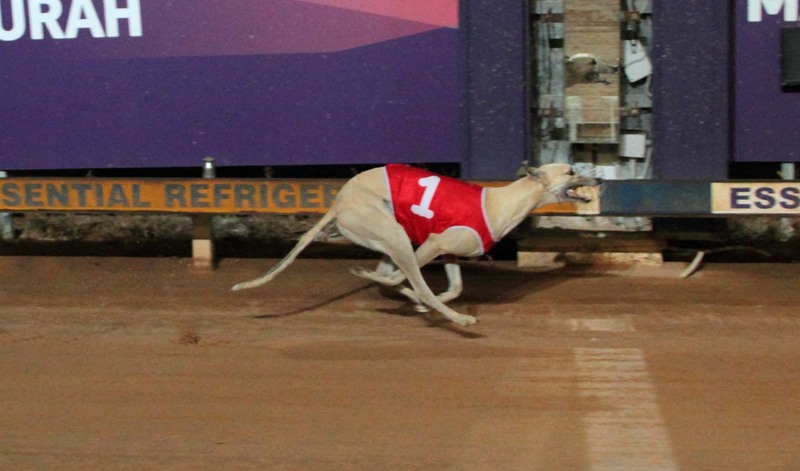 The David Hobby trained dog has now won 3 times from just 5 career starts. LUCY’S OTIS (Dyna Double One- Lucy Wires) railed well around the home corner before shooting away for a 3 1/4 length win over Pocketful in 30.01. The Kody Charles trained dog is owned by Gemma Jovanovic and James Jeffries who earlier in the day became engaged to get married.